I’ve really enjoyed using the fantasy theme to catch up on writing some reviews this month! 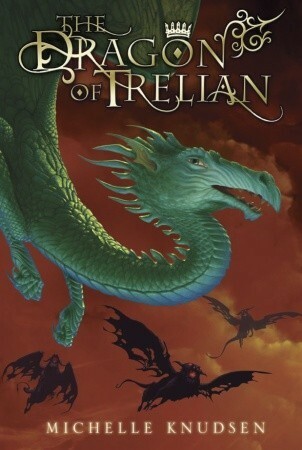 One of the books I stumbled across back towards the middle of 2015 was this little gem: Dragon of Trelian by Michelle Knudsen. Calen is apprenticed to a powerful mage, but lately his interest in the subject of his study has waned, and with it his master’s approval. When they move to Trelian to work for the king and queen, Calen is excited about being in a more central location, but he’s seriously questioning his future and career choices. Meglynn is a princess with a secret. When she meets Calen, she instantly feels she can trust him with this secret – though she is shocked at her own impetuous decision to do so – but there are few people the lonely princess can confide in. Her older sister, who is her best friend in the world, is about to get married and move away. Her marriage will secure an unlikely peace between their own kingdom and the neighboring kingdom with whom there has been a feud for many years. When Meg and Calen discover a treacherous plot to bring ruin down upon all those they love, they must figure out a way to put a stop to the scheme… but what can one mage and a young princess really do against a powerful magician? This was one of those books I sort of happened across in the library by chance. I mostly picked it up because the title had “dragon” in it and the blurb was mildly intriguing, but I wasn’t expecting too much, since the last book I had picked up because of its title had been a colossal disappointment. Happily, this is one of those surprise gemstone books. I thoroughly enjoyed it and could not put it down. I loved the friendship that blossoms between Meg and Calen. There isn’t even a hint of romance in their friendship, which I really appreciated. I wouldn’t mind if their friendship grew into a romance in later books, but I loved that it wasn’t there at all in this tome. Meg does make an impulsive decision to trust Calen rather quickly, but Meg and Calen are young enough (14, I believe, though they both seemed a bit younger than that throughout the story) that it kind of makes sense (I have a seven year old who makes instant best friends with strangers she meets at the park, so it wasn’t wholly unbelievable to me that two children could become instant buddies and confidants). There is a bit of romance between Meg and a young man named Willem… but that gets complicated later on… for reasons I won’t divulge here. Seriously, this is a fantastic book! I loved it. I fell in love with the characters, the plot was exciting and the pacing was fantastic. Though the book is over 400 pages, it never felt slow or boring. One of my favorite things about the book was the relationship between Calen and his mentor (a wizard whose name is currently escaping me… I think it starts with an “S”?) Calen was chosen to be this wizard’s apprentice apparently because the mage saw some “spark” in Calen. However, as the months have progressed, Calen has gotten bogged down in the “busy work” or the laborious tasks of learning all he has to learn in order to be allowed to use magic. Like a student who hears a master pianist skillfully mastering a particularly difficult piece of music wishes to sit down and learn how to play THAT SONG, but instead is told to practice his scales forty-thousand times… Calen does not see the point of the work he is being made to do that seems to have nothing to do with the magic he wishes to master. Because he has grown lackadaisical in his studies, his mentor worries that he made a mistake, perhaps he didn’t actually see what he thought he saw in Calen, and so the already withdrawn teacher pulls away and determines not to put any more effort into this unpromising student than he absolutely must. But Calen’s spark really is there, and though it is a side plot in this wonderful story, I thought that the rediscovery of that spark by both Calen and his mentor was extremely engaging and well-done. Also, there’s a dragon. And that is awesome. I don’t want to give too much away about the dragon, but it’s super cool. Unreservedly Five Dragon Eggs for this one. I need to get to the library to read the rest of this series! Adding it to goodreads as well. Another wonderful find. I especially like the friendship and no romance aspect. Nothing wrong with a little romance here and there, but it doesn’t need to be in every book. Thanks for sharing this one!